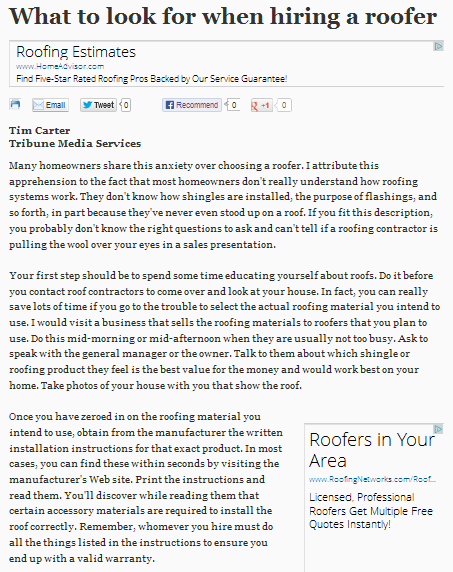 Tim Carter’s article for the Chicago Tribune provides several helpful tips on how to hire the right roofing contractor for your repair or replacement needs. Among other things, Carter stresses the importance of doing your homework – particularly by learning about suitable roofing materials and meeting with manufacturers or suppliers – way before calling in a roofer to carry out the initial assessment. Subsequently, it is also considered a sensible idea to hire a roof inspector who can check your chosen contractor’s workmanship quality after the project has been completed. Your first step should be to spend some time educating yourself about roofs. Do it before you contact roof contractors to come over and look at your house. In fact, you can really save lots of time if you go to the trouble to select the actual roofing material you intend to use. I would visit a business that sells the roofing materials to roofers that you plan to use. Meanwhile, by carrying out a detailed assessment, a reputable Chicago roofer like Rogers Roofing can detect various signs of roof damage that may not have been readily apparent and may in fact be precursors to even bigger problems. Your roofer can then give you a more accurate diagnosis and suggest the appropriate solutions, i.e. whether your roof needs repairs or replacement, as well as suitable alternatives in the event that a major re-roofing job is in order. In any case, be sure to discuss everything in detail with your chosen contractor. As a homeowner, you only want what’s best for your home. Before you hire any prospective roofer, you’ll need to carry out the necessary background checks to find out how well they performed on their previous projects as well as whether previous clients are indeed satisfied with the roofer’s service and workmanship quality. Whether you live in a highly industrialized city like Chicago or a budding village like Orland Park in Illinois, it would be to your advantage to hire Rogers Roofing, a local Orland Park, IL roofing company with a solid reputation for quality and customer service.